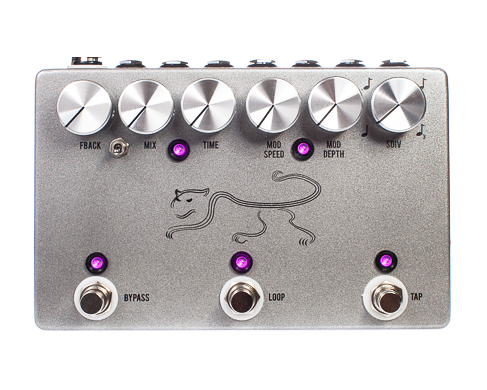 Panther Analog Delay, Delay/Echo/Phrase Sampler for Guitar from JHS Pedals. Product replaced by the JHS Pedals Panther Cub V1.5. 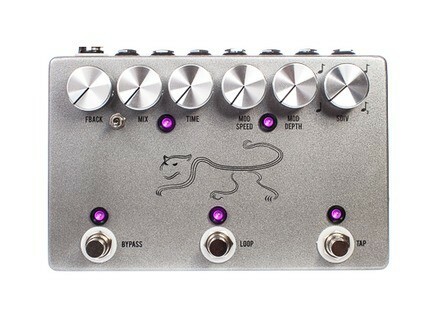 JHS Pedals announces the JHS Panther Analog Tap Tempo Delay. The Panther Delay utilizes an analog signal path and 3205 bucket brigade chip sets and can be controlled by the internal tap-tempo or an external tap tempo pedal. Chirp Toggle Switch – a 2-position toggle to choose between "chirpy repeats or darker repeats"
Tap Tempo In/Out – allows Panther to be controlled by an external Tap or slave another tap tempo drive delay to the Panther and control it by the Panther's onboard Tap. Panther Analog Tap Tempo Delay is available for $499.